Prime rib is a delectable, indulgent cut of beef that delivers an outrageous amount of flavor when prepared just right. Although prime rib is traditionally cooked in the oven or prepared on the grill, it is also well suited for smoking because the process impressively tenderizes the meat, while also giving it a pleasant smoky flavor. Continue reading to learn a simple, step by step guide to smoking prime rib. Prime rib is essentially a standing rib roast that is derived from the top of the rib primal. Technically, it is only considered “prime” if it is prime grade beef; otherwise, it is just standard rib roast. Visit your local butcher shop or grocery store to purchase prime rib by the pound. 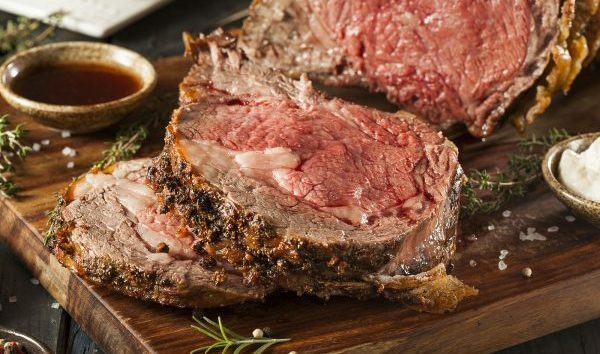 On average, prime rib costs around $18 per pound, and it is recommended to apportion 1 pound per person (this sounds like a lot but keep in mind that there will be some shrinkage). A one bone roast will feed 2 people, while a 4 bone roast might feed between 6 to 10 people or more. The first task in smoking a prime rib is to choose a roast that is the right size for your smoker grill. Some roasts can be as long as 16 inches, so if you plan on buying a seven-bone rib roast, make sure your equipment is large enough. The general rule of thumb is to have at least two inches on either side of the roast so that the heat and smoke can pass by. Start by gathering the right supplies. You will need your smoker, fuel for the smoker, disposable aluminum pan, aluminum foil, meat thermometer, sharp knife, cutting board, and some high-temperature food-safe gloves. As for time, plan on smoking your prime rib for 20 to 30 minutes, per pound. This can vary depending on certain factors, such as the type of smoker you have, how well done you like your beef, and more. Now you are ready to prepare your grill. Read our blog on How to Clean a Barbecue Smoker is yours is fairly dirty. A clean smoker produces the best flavor results. Set your smoker to 250 degrees Fahrenheit. You will cook your prime rib until it reaches an internal temperature between 130 and 150 degrees Fahrenheit. If you plan on using the drippings for gravy, be sure to place a drip pan filled with water at the bottom of your smoker. Although oven preparations rely on the thick layer of fat around a prime rib, smoking does not. You want the meat to be exposed to the smoke, so it is suggested to trim the fat off of your prime rib roast to your best ability. The sharper your knife is, the more efficient you will work. If you are worried about the meat drying out, don’t; the smoking process is meant to cook meat low and slow to retain moisture and build flavor. If you do not want to worry about trimming your roast, simply tell the butcher at the shop that you are planning on smoking it, and they will cut it right for you. If you are using a bone-in roast, it is recommended to remove the bones and tie it all back in place. Read on blog on 3 Reasons Why You Should Tie a Roast for a quick guide to tying a roast. Prime rib is a great cut to work with because it doesn’t require too much seasoning to make it great. You definitely want to give it a generous layer of salt, but from there, you can follow with some black pepper or something herbal. It doesn’t need anything more complex than that. Then, wrap your prime rib roast in plastic wrap and let it sit out on the counter at room temperature for 2 to 3 hours before putting it in the smoker. As for wood in your smoker, choose a mild one so you do not overpower the meat with a smoky flavor profile. Read our blog on Various Wood Chip Options for Smoking Meat for suggestions. Once your smoker is heated, and your roast is finished setting, place it inside on the rack, bone side down. If your smoker only produces heat from one side, face the bones away from the meat to start. And if you are using wood chips, add them too. Now you just close the door and let the smoker do its job! Halfway through cooking time, don your heat-safe gloves and rotate the roast to guarantee balanced cooking. At this time, also check the drip pan to ensure it still have plenty of water. Then, check the internal temperature of the roast; halfway through cooking, it should be between 100 and 200 degrees Fahrenheit. Because your roast will rise in internal temperature by 5 degrees Fahrenheit once you remove it from the smoker, be sure to calculate correctly. Once the roast is approaching its target temperature, wrap it in aluminum foil and let it finish out in the smoker. Regardless of which finishing option you choose, once you are done cooking your roast, wrap it in aluminum foil, place it on a large dish, and let it rest for 10 minutes or so. See our blog on The Benefits of Wrapping and Resting Your Meats After Cooking to learn more. After the meat has rested, transfer it to a cutting board and start slicing away! Aim for thicker slices, as thinner ones will dry out quickly. Do You Love Smoked Beef? Come to Rackz BBQ for Mouthwatering Beef Brisket! Rackz BBQ is eager to impress you with our delicious beef brisket meals and barbecue cuisines. As a Carmel BBQ restaurant dedicated to quality and value, you can trust us for exceptional customer service, neighborhood prices, and most importantly, authentic barbecue fare that you will love. Contact us at 317-688-7290 to place a call ahead order, or to learn more about our menu selections, prices, and specials. This entry was posted in Cooking Tips, Smoked Meats and tagged how to smoke prime rib, prime rib roast tips, prime rib smoking tips, reverse searing prime rib, smoked beef restaurant Carmel, smoking a prime rib. Bookmark the permalink.